This is just a random small tutorial for social networking freaks, as some people asked this question how to post to all networks at once, we came up with something easy enough. Most people are familiar with the lines written above. Yes, these are some of the thoughts of Mark Zucherberg that were reflected in the movie The Social Network and it shows why we need a social network. Taking the entire social experience of college, it mentions, but actually it revolutionized the way we thought about social networks. It’s 27th September, 2014 and right after three days, we will say goodbye to the oldest social network and probably one of the most popular social network that we used to use in our early teenage, well, Orkut is shutting down permanently on 30th Sep, 2014. Orkut will be a past, but now new players are there to rule the world and speaking about social networks, Facebook, which started from a dorm room in Harvard University seems to dominate the entire world of social networks and the top 3 players in the list are Facebook, Twitter and Google+. Google+ could not have been here if Facebook was not invented, actually the relationship between Facebook and Google is simple as math, they just don’t like each other. And now, most people are very concerned abut sharing whatever they do, wherever they go and everything else on the social networks and I have many friends, among which actually some needs to be active on all the networks for professional purpose and to reach out to more people. And some are there, who are always online, talking to one another on social networks, tweeting and updating everything they like, who wanna get connected on all three of them. So, I came up with this thought of making it simpler and easier, where you don’t need any app or any special tool to post to all social networks at the same time. This is a step by step guide, follow it carefully or else you may mess up everything. 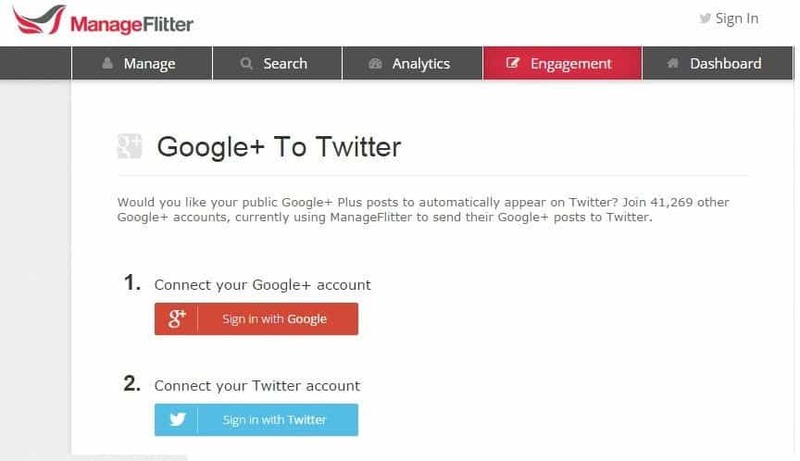 Go to Manageflitter website which offers a great way to share everything across Google+ and Twitter. Click on ‘Sign in with Twitter’ button, it will redirect to Twitter and ask you to authorize the app to access your Twitter account, if you’re already logged in you just need to Sign in and provide access. Now select ‘Sign in with Google’, you will be redirected to Google+ authorization page if you’re already logged in, otherwise log in and hit the ‘Accept’ button. 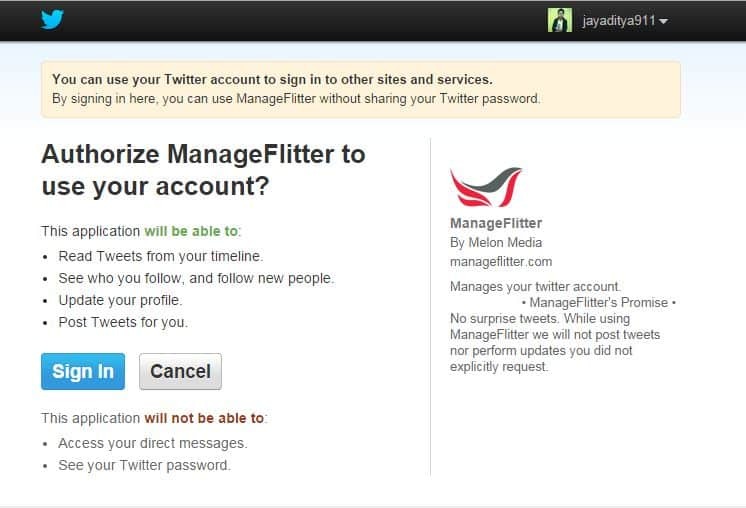 When you accept, you will be redirected and it will show that you have connected your Google+ profile to Twitter. 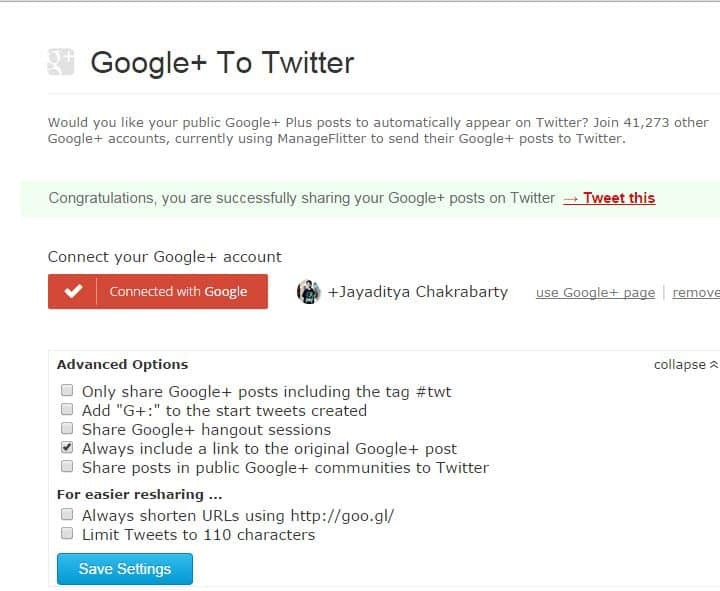 Now, whatever you post on Google+ will be automatically posted to Twitter also. Below that there is an ‘Advanced options’ area where you can customize a few things. For now, you will be able to post to Twitter whenever yo post to Google+, but what about Facebook? We need to connect all three social networks, but there are no options here, so we will just make a chain. Go to https://twitter.com/settings/profile and at the bottom of the page you will find a section ‘Facebook’. 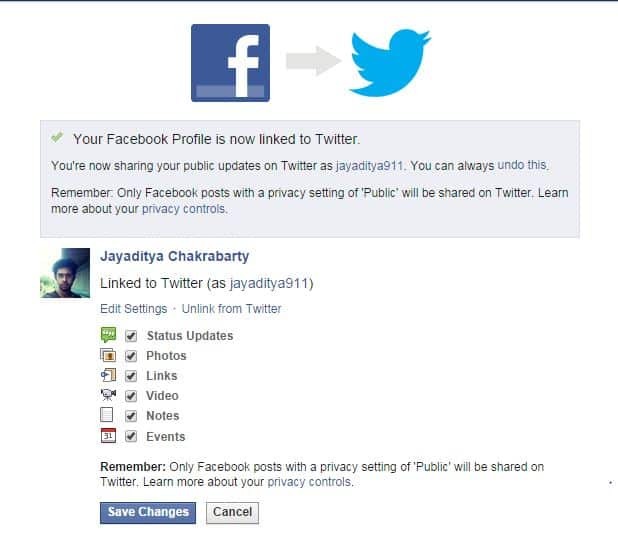 Just select ‘Connect to Facebook’ and it will open a small window where it will ask for permission, while authorizing it be sure to select the default privacy settings when you post via Twitter. Select you preferred privacy and save. 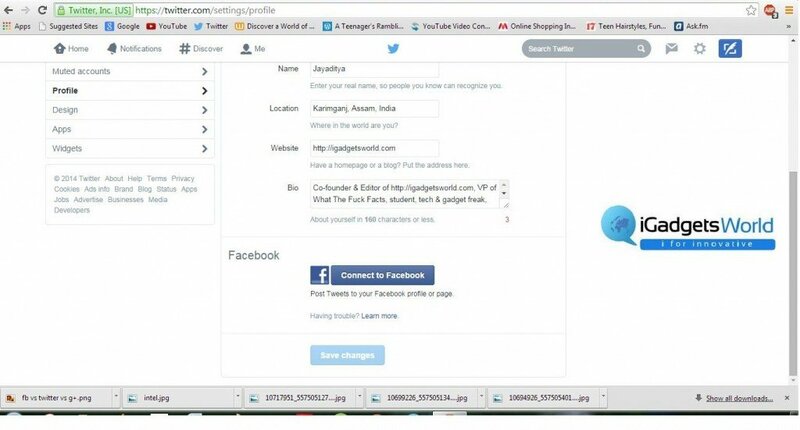 Now Twitter will show that you Twitter account is linked to Facebook. There you can also select any one of the Facebook pages you manage, so that you can use Twitter to post to your Facebook page also. 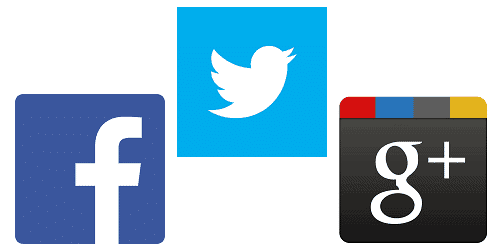 Well, now you can share everything you like between these three social networks. Now, some people are not comfortable enough with Google+ and Twitter, for them there is one option. They can post to Facebook and Twitter at the same time. Whatever they share on Facebook will be automatically posted to Twitter. I will show how to do that. Go to https://www.facebook.com/twitter/ and you will see option to link Facebook to Twitter that means whatever you post on Facebook will also be shared on Twitter. When you click ‘Link to Twitter’ it will redirect you to Twitter and you just need to authorize the app. When you have authorized the app, Twitter will again redirect you to Facebook and it will show that you have linked Facebook to Twitter.There you can see options to select what kind of contents you want to tweet via Facebook. You can share status updates, photos, videos, links, events and notes. Select the stuffs you like to share to Twitter via Facebook and hit ‘Save changes’. Also, in the section below, you can connect your Facebook pages to the Twitter account. 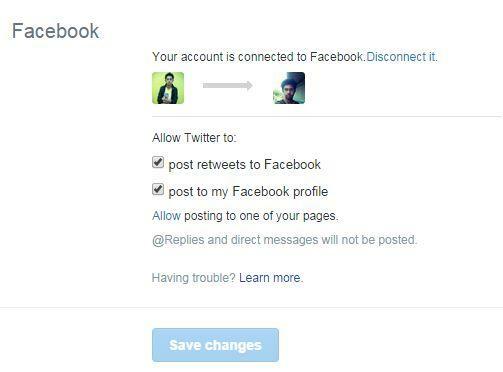 This is for connecting Facebook to Twitter, so that whatever you post on Facebook will be automatically tweeted to Twitter. This is for those people who use Facebook and Twitter, if you need all three of Facebook, Twitter and Google+ you have to go with the first method. That’s a very short and easy method for posting to multiple social networks, if you still have any doubts, you can contact us below in the comments section below. Otherwise, you can also directly message us to our official Facebook page or tweet to us at @iGadgets_world on Twitter. We will try to get in touch with you as soon as possible.